Behold, the Bavarian village where Kandinsky painted the landscapes that catapulted his work into cacophonous, abstract whimsy. 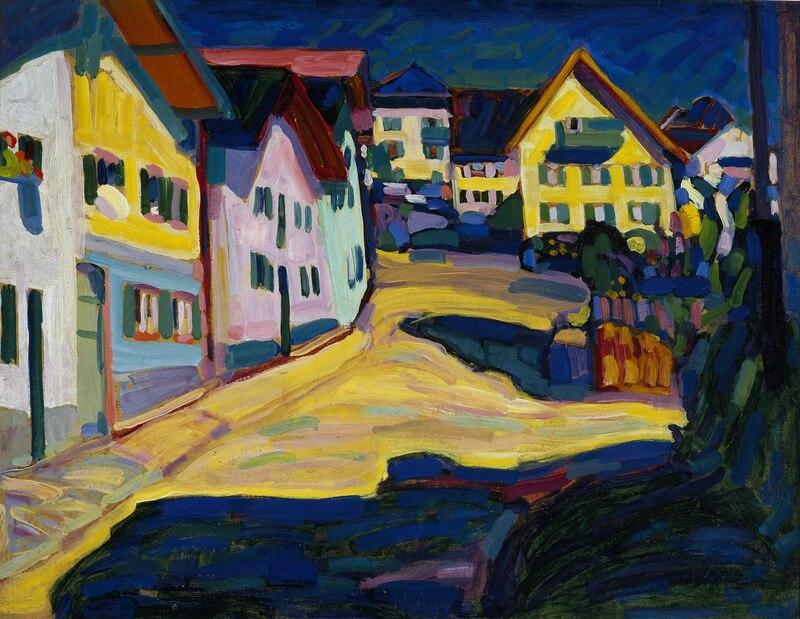 Kandinsky lived in the German hamlet of Murnau for five years with his lover, Gabriele Munter, who would become a founding member of Kandinsky’s primary art movement, Der Blaue Reiter (The Blue Rider). They had met in Munich when Munter was one of Kandinsky’s students. But, since Kandinsky was still *technically* married to his first wife, their relationship was not exactly on the books. They left Munich in search of a little freedom. After traveling the world for a few years, they settled at the foot of the Bavarian Alps in the Murnau home that Munter had purchased. Their abode was a quirky little spot known as the Russenhaus (“House of the Russian,” which referred more to Kandinsky than to Munter). They decorated the place together, and doodled on the furniture with their hand-painted designs. Surrounded by beautiful gardens and mountains, they both loved to paint the inspiring views from their windows. And their home became an important meeting place for Blue Rider artists. What a sweet life indeed. But this little honeymoon didn’t last forever, and neither did their love. As World War I began, Kandinsky had to return home to the relative safety of his native Russia. At this point he *finally* divorced his first wife, but then dealt a low blow when he quickly turned around and married a lady by the name of Nina von Andreewsky. Guess he had to move on. Ah, well. At least they’ll always have Murnau.